"When purchased as puppies it is very difficult to discern how much wolf will actually present in the animal." Ben Hull never intended on getting a wolf dog - he actually wanted a husky. But when he saw an advertisement in a local newspaper for wolf dog puppies, he got curious, so he went to the breeder's house to check them out. 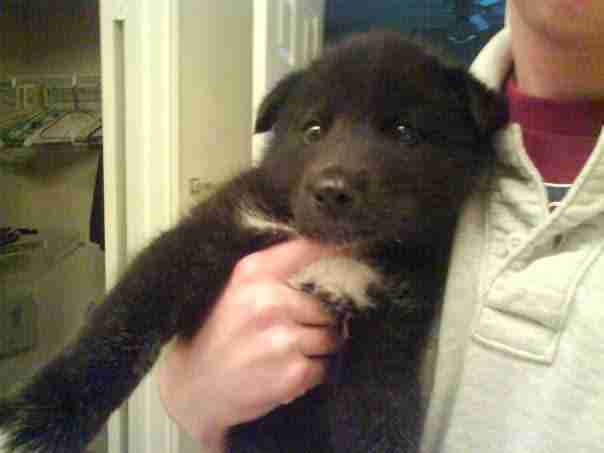 As Hull stood at the breeder's front door, a black wolf dog puppy broke out of his kennel, ran through the house and leapt into Hull's arms. 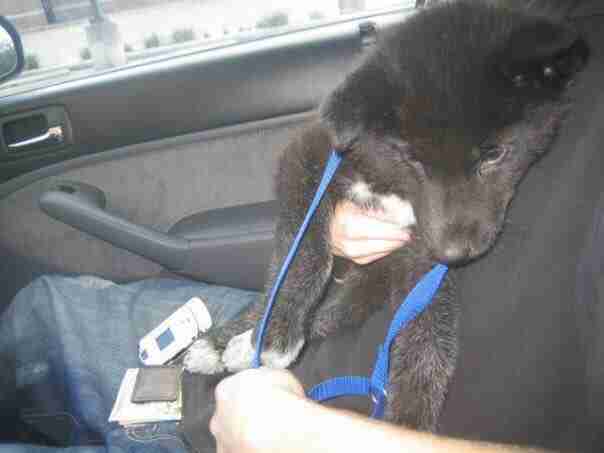 This rambunctious puppy wriggled his way into Hull's heart, and he went home with him that day. Hull describes that decision as the best, and also the worst, thing he ever did. 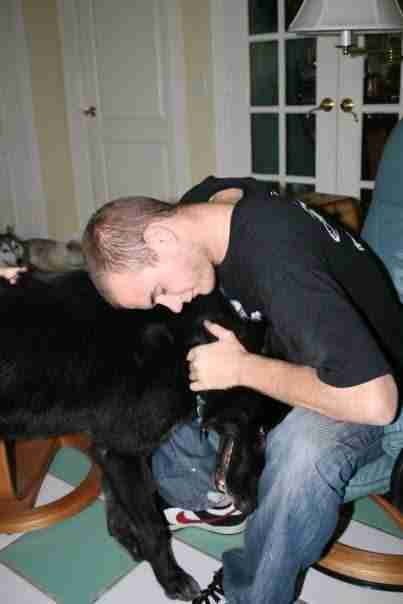 Hull and the puppy, whom he named Shade, formed a very close bond, but Shade quickly became a lot of work. Within days of coming home, Shade started having behavior issues. "At first he would jump on people in a friendly way, just wanting to smell or lick their faces like any big, hyperactive puppy would do," Hull told The Dodo. "It was later, and as he got older, that this turned into being aggressive." Shade was very possessive of Hull, and also of the rest of his "pack," which included Hull's parents and their two dogs, Sasha and Chuy. But Shade would bark and chase away anyone who wasn't in the pack, even if he'd met them before, according to Hull. 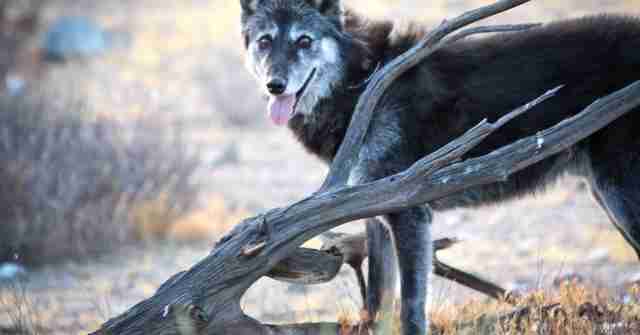 Hull did as much research on wolf dogs as possible, and tried to remedy Shade's behavior. But he quickly came to the conclusion that he couldn't give Shade the care and training he needed, and that a suburban house probably wasn't the best place for him. Hull also did some research on the breeder where he got Shade, and he started to suspect that Shade had been inbred, which may have exacerbated Shade's behavior problems. "The breeder was a former animal control worker and so he trusted her when purchasing Shade, but when looking back, he figured out that Shade's mother was also probably his grandmother," Cate Salansky of Wolf Connection, the wolf and wolf dog sanctuary where Shade eventually ended up, told The Dodo. When Shade became too much to handle, Hull decided to rehome him with a couple living in Southern California. This couple had owned several wolf dogs before, so Hull thought Shade would fare better with them. But even here, Shade acted out. 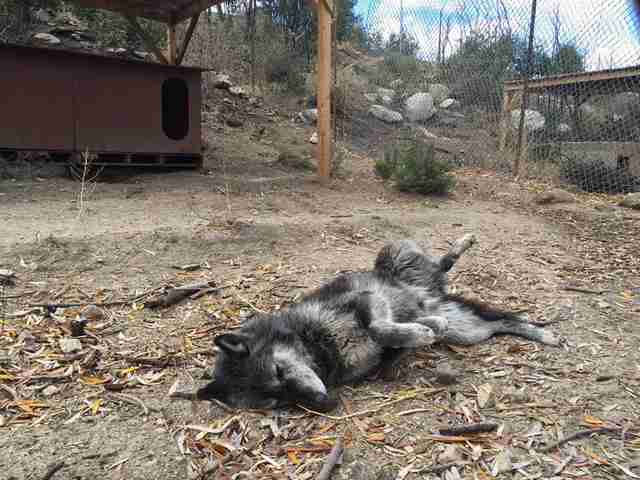 After about a year, the couple reached out to Wolf Connection, and asked the sanctuary to take Shade. This turned out being the best solution for everyone. Shade adjusted to the sanctuary immediately. After spending time in a kennel by himself (which allowed the sanctuary staff to assess Shade's behavior), he was paired with Maya, an alpha female wolf dog. "Maya speaks 'wolf' very clearly and has the confidence and communication to deal with other wolf dogs who don't have those skills yet," Salansky said. "She's his comfort blanket and is the one he goes to for affirmation when he starts becoming triggered." Shade and Maya lived together for a couple of years, but the sanctuary staff eventually realized Shade was the kind of wolf dog who loved his space, and that he'd be happier on his own. Even so, he and Maya continue to have playdates, according to Salansky. Shade also loves going for hikes. "He goes out on lengthy hikes almost daily to explore the 165 acres of Wolf Connection," Salansky said. "Shade is so hyper-alert of every smell, sound and movement around him, and that awakens you to do the same, including your attention to Shade's body language. He's a very quiet, purposeful hiker and is always in the 'now.'" Hull couldn't be happier about Shade's new home at the sanctuary. Hull lives in the Netherlands now, but whenever he's back in the U.S., he goes to visit Shade. "I am so grateful to the couple that they found the people at Wolf Connection, and found Shade his new home with people that love and care about him," Hull said. 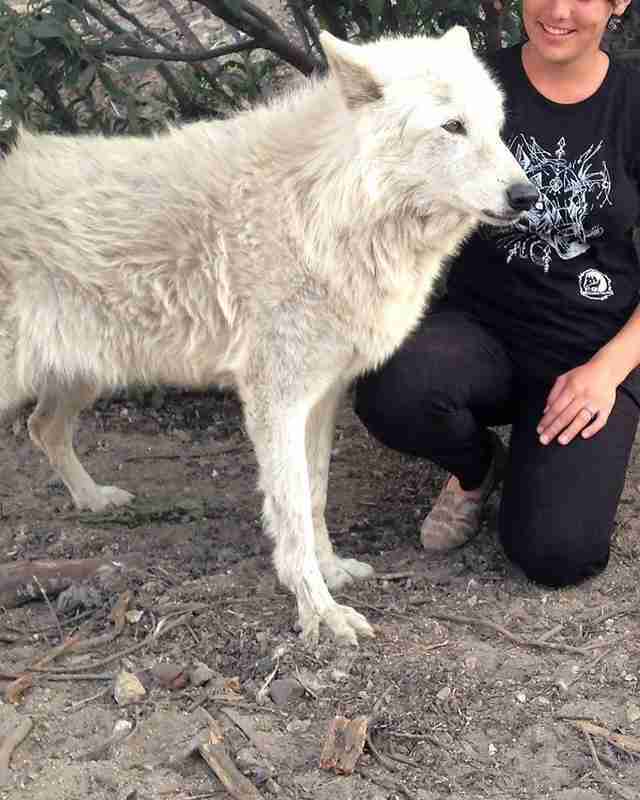 "Seeing his new life whenever I visit Wolf Connection is such a happy and emotional moment for me." While Shade was lucky to end up at a sanctuary, many wolf dogs are dumped at shelters when they become too much to handle. Once wolf dogs are in the shelter system, they don't last long. Not only are they difficult to rehome, but wolf dogs are illegal in some states, which means that shelters can't legally hold them. For these reasons, wolf dogs are often euthanized within a week, Giulia Cappelli, lead of programs at Wolf Connection, explained to The Dodo. Even if some people can be responsible wolf dog owners, Cappeli said she doesn't recommend getting wolf dogs in the first place. "When purchased as puppies it is very difficult to discern how much wolf will actually present in the animal," Cappelli said. "The majority of owners are not prepared for true wolf physicality, intelligence and general behavior. Without the proper containment, understanding and pack orientation, the mid- to high-content wolf dogs can easily escape and end up in a shelter where they are recognized as having wolf content." "In the process of trying to keep their wolf dogs from escaping, without proper containment, many owners may resort to tying up their animals with chains or wires," she added. "This situation usually leads to abuse and neglect though it starts with good intentions." "Shade is extraordinarily lucky that he chose Ben that day to be his human," Salansky said. "Who knows how many of Shade's relatives were purchased by owners who simply gave up on them when their behaviors were not in line with what they were expecting and rescinded them to an animal shelter? Ben set forth the path for Shade to live safely at Wolf Connection, and Shade now has a wonderful life by being a part of a large pack of balanced wolfdogs." 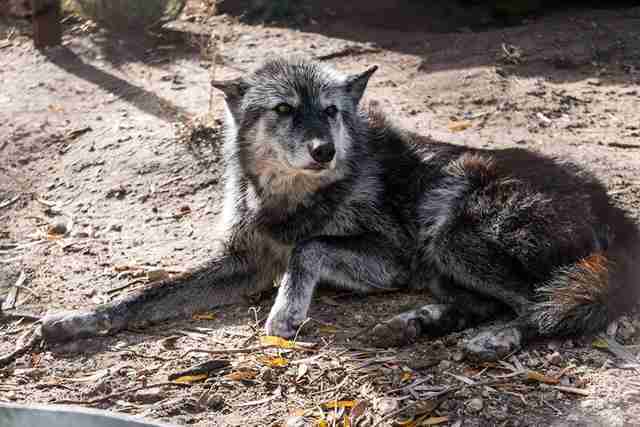 To help Wolf Connection rescue more wolves and wolf dogs like Shade, you can make a donation.